It's great to be in Vishal Bhardwaj's [inset] shoes right now. After all, who wouldn't want to be the man behind the year's possible blockbuster? Ever since the Kaminey, starring Shahid Kapoor and Priyanka Chopra released on Friday, critics have been going gaga over it. Everything about it -- music, performance, plot, editing, dialogues, the film -- critics say, is top class. And it's all thanks to Vishal. So how did the genius behind Omkara and Maqbool come up with Kaminey? Patcy N finds out. I think I used the word 'kamina' because I'm one of them. It's also in the way you say the word -- it can be said in a loving manner or in anger. I remember seeing Gulzarsaab's film Izazaat where Anuradha Patel is giving Naseeruddin Shah a foot massage. Naseer lovingly tells us her, 'tum bahut badi kamini ho'. That was the first time I heard that word used in a loving manner. I liked it so much that I started using it on my girlfriends. Anyway, when the script of this film was written, it was like discovering your own mean side. The format of the film is of a caper and all the characters in this film, excluding one, has an agenda. So I thought it was an apt title for the film. Then I met Gulzarsaab to tell him that I have decided to use Kaminey as the title of my film. He liked it and suggested we make a title track too. Initially, people reacted to the title with shock. Even Shahid found it hard to believe that the title of his film is Kaminey. Now, people have come to accept it. What have you been doing for the last three years? I did plan a few movies but nothing came out of them. I started work on this film about a year and half back. Why do you always make 'dark' films? Darkness is fascinating. If you get to see two movies say one on Swami Vivekananda and another called Daku Sultana, you will see Daku Sultana because it has fights, dance and glamour. That said, you can see darkness in a lighter sense too. I always wanted to make a film with speech disorder. But 15 minutes into the film you will forget about the disorder and start accepting them as characters. So if you can accept that person as a normal human being, then it will be my success as a filmmaker. Why did you cast Amole Gupte? It was casting director Honey Terhan's idea. And I think it was a brilliant idea. Amole is great in this film. My writers helped me a lot. Writers like Shiv Subramnayam and Hrishikesh Joshi also helped me. Amole helped me many times when I went wrong or when a line sounded fake. Who is the meanest of all in this film? I am the meanest of all. The person behind the camera is the most kamina. Are you satisfied with Shahid and Priyanka's performances? Yes. Actually, they were better than I'd expected. I never thought that Shahid and Priyanka were such intelligent actors. I had never worked with them so I thought they were like any other actor. But they did justice to the characters. I am very disappointed by that. But since I cannot do anything about it, I'm resigned to it. We talk about how Ghajini got a U/A certificate and how they regret the decision now. I feel that injustice has been done towards us. We should have a grading system. Now we have only three categories -- U, U/A and A. The U/A category is very ambiguous as kids between the ages 12 to 15 can see the film. I think we should have categories for kids between this age group too like they have abroad. What were the objections raised against Kaminey? 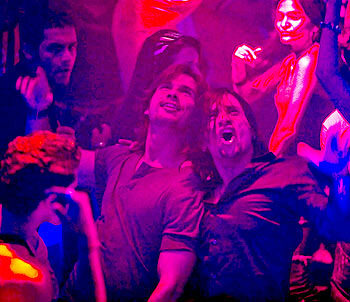 Kaminey is a very comic book kind of film but they objected to the violence. There is not even one swear word in the film. The only one that was there was removed during dubbing itself. I faced a lot of flak when we used bad words in Omkara so I made sure that Kaminey didn't have any. The violence we'ce shown is of the comic book kind. I believe there is more violence in the video games that my son plays. Violence has become part of our life and we cannot stop it. What we need to do is learn to live with it. The Censor Board had a problem that we are showing violence as entertainment, which I think they have a point. But when we asked for rating we were shocked to know that this proposal has been pending in the Parliament for the past six years. The ministry has been trying to have one category for 15 plus but it never even reached where it should have. It's really sad that we entertain all of India as a film industry but we can't even get a bill passed. I feel that this film should have gotten a U/A certificate. What were the cuts asked? Very silly cuts and changes were asked -- like a dialogue where an actor asks another the place that he hails from. The other actor replies that he is from Pilibhit, UP. Though the dialogue was not political, we were asked to change as Pilibhit is a controversial constitution in Uttar Pradesh. In the end, we had to change it to Barabanki. Such type of changes are very irritating for filmmakers. How would you compare Shahid and his father? Pankaj Kapur is a great actor and Shahid has his genes. From among the age group that he belongs to, Shahid is the most intelligent, talented and sensitive actor. Is it true that you have changed the ending of the film? I have not changed the ending but I have added a song which was not there before. It's not in album too but we will soon incorporate it in the new CDs. Tell us about the music of this film. I have always tried to have music according to the script of the film. Gulzarsaab has written all the songs. In fact, we composed one song very recently. Music is very special. I have sung the title song in this film.